A symbolic wedding in Italy is one of the most popular wedding ceremonies for Destination weddings in Italy. Couples have the complete freedom to plan their symbolic ceremony wherever they wish. For a symbolic wedding there is no paperwork required. For your symbolic wedding in Italy you can choose any beautiful location without restrictions. Our portfolio features over 500 private villas, antique palaces or the most charming castles all over Italy. We suggest you the most charming wedding location and make the reservation for your dream wedding location. 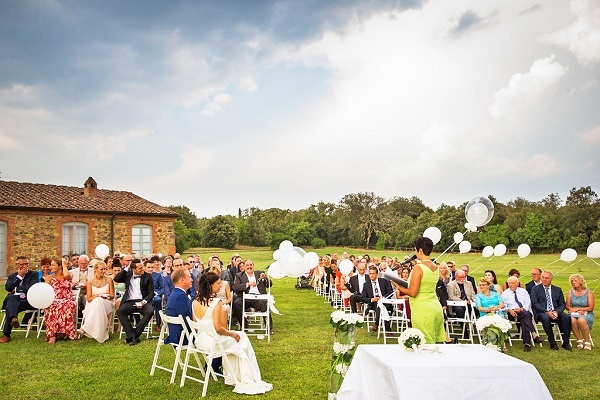 We provide the perfect celebrant for your symbolic wedding in Italy! We assist with personal vows, music, poetry, singer and decoration. Your friends and family are welcome to participate in making the event even more special and unforgetable. What does your symbolic ceremony involve? A symbolic ceremony usually involves a reading, a hymn or a song. You could include traditional wedding music, or something that has special meaning for the two of you – there’s lots of scope for making the ceremony your own. – Unity Candle Ceremony: a ceremony that can be done just by the bride and groom or you can involve also your parents: the mothers of the bride and groom hold a candle to their children, with the bride and groom light the two candles together a third candle that represents their Union. – The Spouses Brindisi: a typically Italian tradition, the toast at the end of the ceremony can only be done by Spouses or it can involve witnesses or their parents: bride’s fathers pour wine in the glasses, mothers offer them to bride and groom and they, after having exchanged their glasses, toast with all guests.